Today's Rediscovery represented a significant turning point for an artist who'd already made a name for himself in the '70s as part of the scene that included Brecker Brothers, David Sanborn and Mike Mainieri. 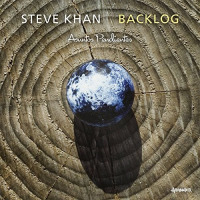 Guitarist Steve Khan, along with playing with many of the artists in that axis, had released his own trilogy of fine recordings on Columbia Records between 1977 and 1979albums that all reflected that scene's more funkified approach to fusion. 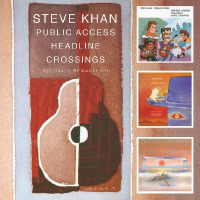 With his signature Fender Telecaster assertively high in the mix, Khan had already (and quickly) demonstrated a distinct conception that rendered him instantly recognizable; still, by the time of 1979's Arrows, it seemed as if the guitarist had taken the concept about as far as it could go. 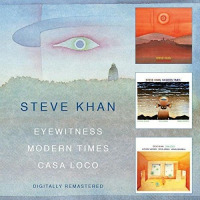 And so, in 1980 he released Evidence (Arista/Novus), a wonderful solo album of layered electric and acoustic guitars that, in addition to inventive reworking of music by Wayne Shorter, Horace Silver, Lee Morgan, Randy Brecker and Joe Zawinul, had a side-long Thelonious Monk medley that, along with the rest of the record, suggested that change was in the air. Change that was made all the more clear with the release of Eyewitness the following year...and the subject of today's Rediscovery. A quartet record with electric bassist Anthony Jackson, drummer Steve Jordan and percussionist Manolo Badrena, it represented change, in fact, on a number of fronts. First, while it was, indeed, still an electric record, it demonstrated considerably more restraint and less of the pedal-to-the-metal aggression of Khan's '70s output. Second, the guitarist had replaced his overdriven, in-your-face Telecaster with a warmer, less hard-edged Gibson ES-335 that, with an oblique yet lyrical approach to linear soloing that was far more sophisticated than anything he'd done before, took the forward motion of Evidence even further. This was a fully matured guitarist who no longer sounded like he had anything to prove, but instead let the music and tremendous chemistry of this group say everything that needed saying. 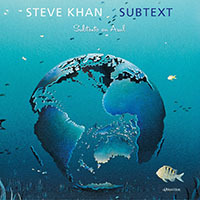 Third, with some of the more complex rhythms underlying tracks like the opening, group-credited "Where's Mumphrey?," Khan introduced an interest in Latin rhythms that continues to this day on albums like his most recent Subtext (Tone Center, 2014). The interplay demonstrated by a band that would ultimately become known simply as Eyewitness on subsequent albums including the excellent live album Blades (Antilles, 1982) and even more impressive Casa Loco (Antilles, 1983) was already at a deep, mitochondrial level. This was a group that listened intently and intensely; it also rejected meaningless displays of virtuositya tack that only made every member of Eyewitness all the more impressive and commanding. As a writer, Khan had undergone a paradigm shift, as a guitarist, an epiphany. The bluesy infections heard on earlier albums like Tightrope (Columbia, 1977) are still there to be found in the theme to the guitarist's ethereal ballad, "Dr. Slump." And the sound of his Telecaster may have been retired but, on this track, a characteristic Fender twang is still present and accounted for, albeit with the choice of a mellower middle pickup Stratocaster tone; that Strat was also used for overdubbed layers of volume pedal swells and chorus-laden chords throughout Eyewitness. But most importantly, with an improvisational approach that rejects "look at me" pyrotechnics for a more considered, compositional stanceeven as, during the guitarist's solo on the lengthy "Guy Lafleur," he makes clear that he's lost none of his chopsKhan proves, with Eyewitness, that less truly can be more. It's an approach that Khan would continue to hone in the ensuing years. Eyewitness may have effectively dissolved, with the guitarist recruiting different lineups for albums ranging from Got My Mental (Evidence, 1996) and The Suitcase (Tone Center, 2008)-culled from an incendiary 1994 live date with Jackson and Dennis Chambersto the remarkable Borrowed Time (Tone Center, 2007), but the lessons learned on Eyewitness are there to be heard on each and every one of them, making it an album both seminal in the guitarist's discography and rife for Rediscovery.